More than 1,600 exhibitors and close to 30,000 attendees descended upon Salt Lake City for the Outdoor Retailer Summer Market trade show the week of Aug 4-8 where top new products and industry standbys filled the exhibit halls. Trends this year include a wide variety of standup paddleboards, kayaks, ultra-light camp stoves and renewable devices that incorporate solar panels and multiple uses. 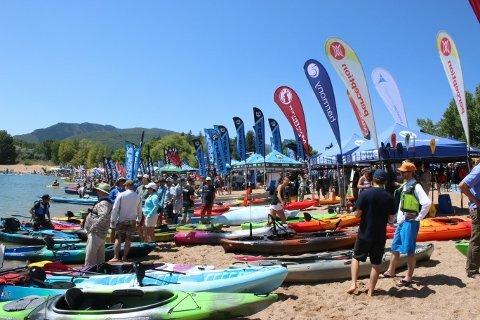 Standup paddleboarding is one of the fastest growing outdoor sports in America, so it’s no surprise they occupy a huge share of this year’s Outdoor Retailer show. New this year were paddleboards specifically designed for fishing. Also trending this year are multi-functional devices. Nearly everything with a battery these days also charges your cell phone or other electronic devices. There are flashlights, lanterns and hand warmers that all double as charging devices. Even a turkey sandwich at the convention was said to charge a cell phone. Ultra-light camp stoves that burn bio-mass or liquid fuel are also showing up in large degrees this year as well are a myriad of products that utilize lightweight, portable solar panels. Look for our continued coverage of the top products that caught our eye.